When your MVS slots have worn out or have become increasingly unreliable, this is the best solution to make your system function like new again. 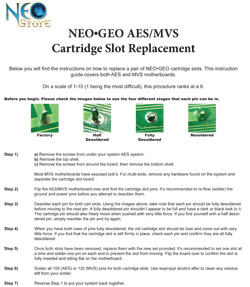 Each MVS cartridge system requires 2 slots and there are no differences between slot A and slot B. This kit includes a pair of new slots (total of two individual slots) for the Neo-Geo MVS system, along with printed instructions in full color. These are 3rd party and not SNK made.